Air Marshal Raghunath Nambiar (left on dais) PVSM AVSM VM & Bar, Air Officer Commanding-in-Chief, Western Air Command addressing the participants of Half Marathon before flagging it off at Jawahar Lal Nehru Stadium today organized as part of birth centenary of Late Marshal of the Indian Air Force (MIAF) Arjan Singh DFC. Late Marshal of the Indian Air Force Arjan Singh DFC was the first and only "Five Star" rank officer of Indian Air Force. His passion for the game of Hockey was unparalleled. The IAF legend had always been an inspiration to air warriors leading from front not only in the war front but also in the field of sports. 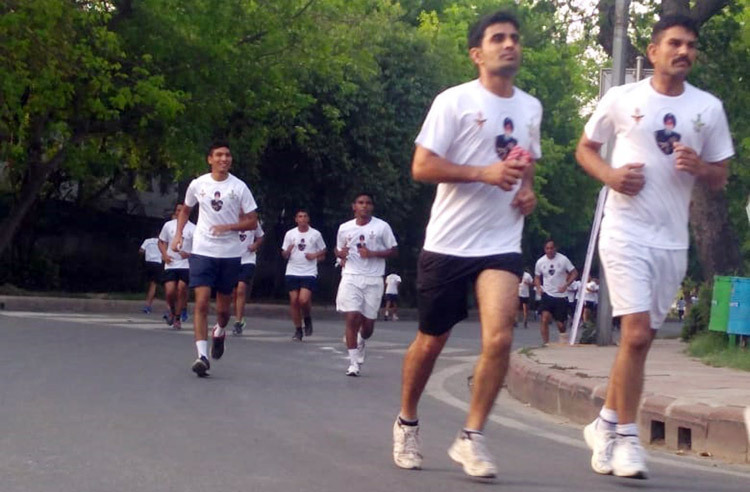 Participants of Half Marathon organized as part of birth centenary of Late Marshal of the Indian Air Force (MIAF) Arjan Singh DFC at New Delhi today in action. Chief of the Air Staff, Air Chief Marshal BS Dhanoa, giving away the prizes to the winners of Half Marathon during closing ceremony held at Jawahar Lal Nehru Stadium today as part of birth centenary of Late Marshal of the Indian Air Force (MIAF) Arjan Singh DFC. ; Air Chief Marshal BS Dhanoa addressing the participants of Half Marathon during closing ceremony held at Jawahar Lal Nehru Stadium today as part of birth centenary of Late Marshal of the Indian Air Force Arjan Singh DFC .